On Sunday afternoon, I went to a symposium in honour of Bruce Lipshutz, who won the Herbert C. Brown Award for Creative Research in Synthetic Methods. The line-up of dynamic chemists and one chemical engineer!) was impressive and his work stood out as being truly ground-breaking. He started by asking the question: Why do we do synthesis “the way we do”, when Nature does her reaction in an aqueous medium, at around 37 C, and using only trace amounts of metals for catalysis? Organic solvents are the main polluters from synthetic chemistry and the number of years until many metals are extracted to exhaustion is sobering. While chemists don’t use these reagents lightly – it is not like its possible to magically make a lipophilic compound water soluble! And metals like palladium enabled reactions that were previous impossible – there is a move now towards developing new synthetic methods that address these issues. 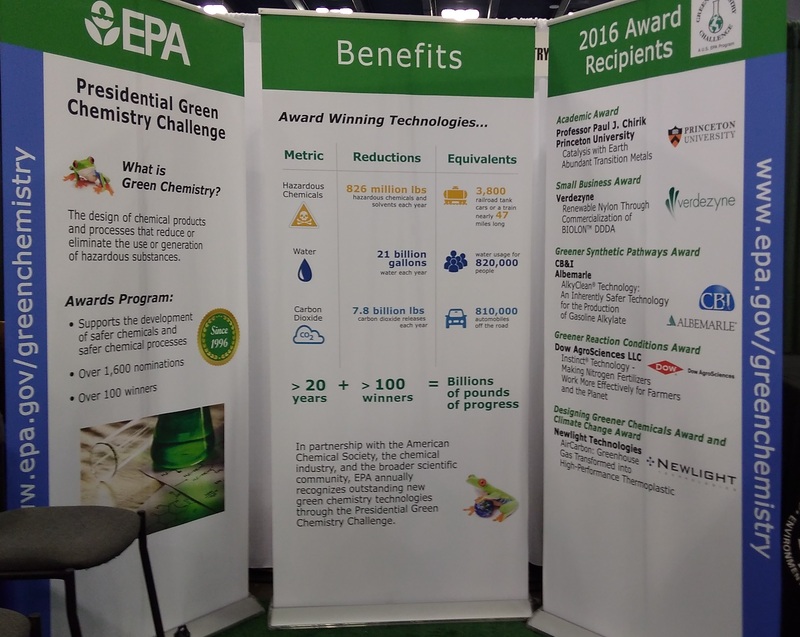 For example, the green chemistry challenge from the US Environment Protection Agency who had a stand in the Exhibitor’s hall. 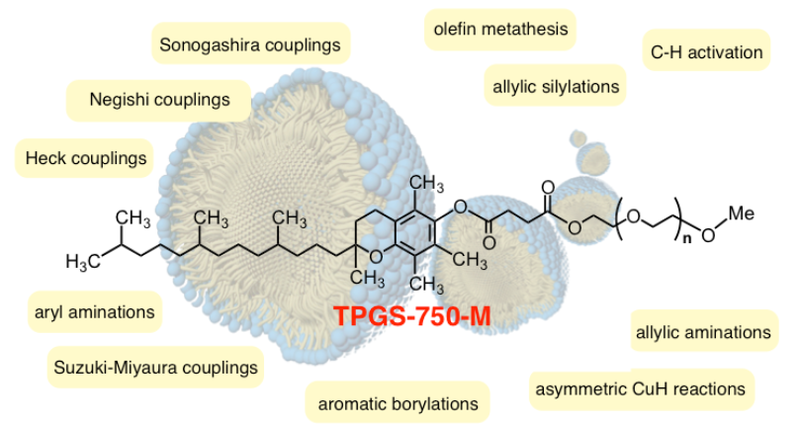 To address the solubility issue, Prof. Lipshutz’s team have developed a nanomicellar technology where organic reactions occur inside micelles formed from designer surfactants. Here water is not a solvent, but a medium – the reagents are not in solution, they are in a more dynamic state and are highly concentrated in the micelles. From the image below (taken from the Lipshutz Team website), the list of reactions that they have worked on is staggering. They have been working on using iron nanoparticles doped with Pd, Ni or Cu to perform catalytic reactions such as Suzuki-Miyaura cross couplings, Sonagashira coupling, and reduction of nitro-containing aromatics. What is notable, is that they are getting really good yields with lower catalyst loadings than those used in traditional organic synthesis; and that they are able to do may of the reactions – in some cases quite unexpectedly – under ambient conditions.